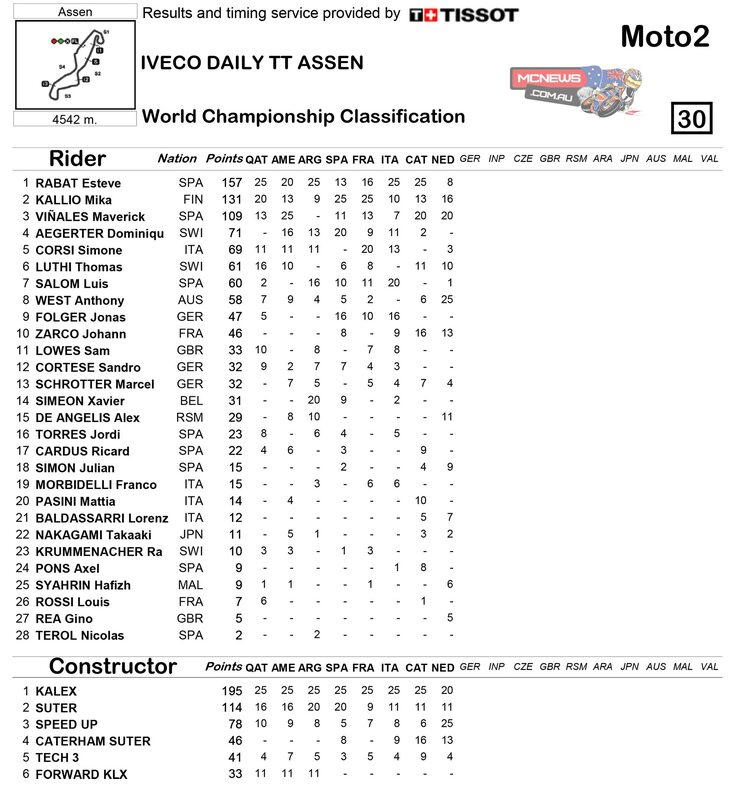 Wet specialist Anthony West (QMMF Racing Team) took Moto2™ victory at the Iveco Daily TT Assen, using all his experience to finish ahead of Maverick Viñales (Pons HP 40) and Mika Kallio (Marc VDS Racing Team) who joined him on the podium. 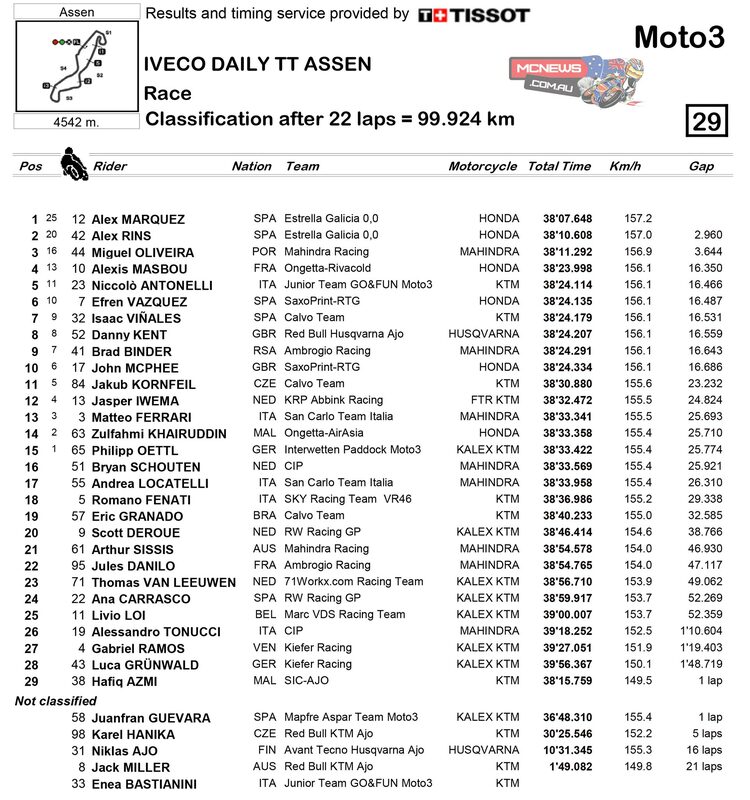 The 32 year-old Australian former premier class rider won from 23rd on the grid in his 211th Grand Prix, crossing the finish line 0.3s ahead of Viñales, with Kallio 0.4s further back. 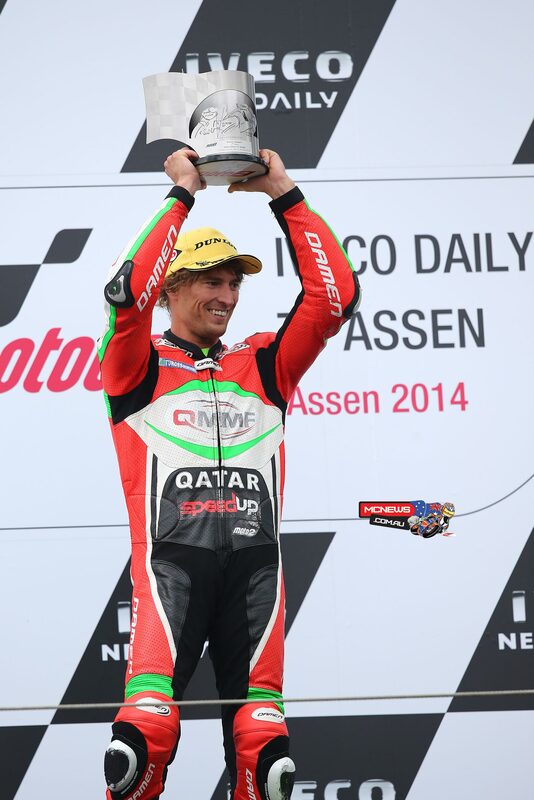 It is West’s first win since the 2003 Dutch TT. 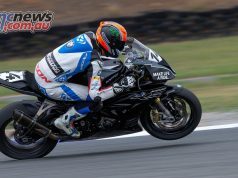 The race start was delayed by 20 minutes as heavy rain fell on the initial sighting lap with pole man and championship leader Esteve Rabat (Marc VDS Racing Team) crashing in that first outing. Rabat still started on pole and eventually finished eighth. 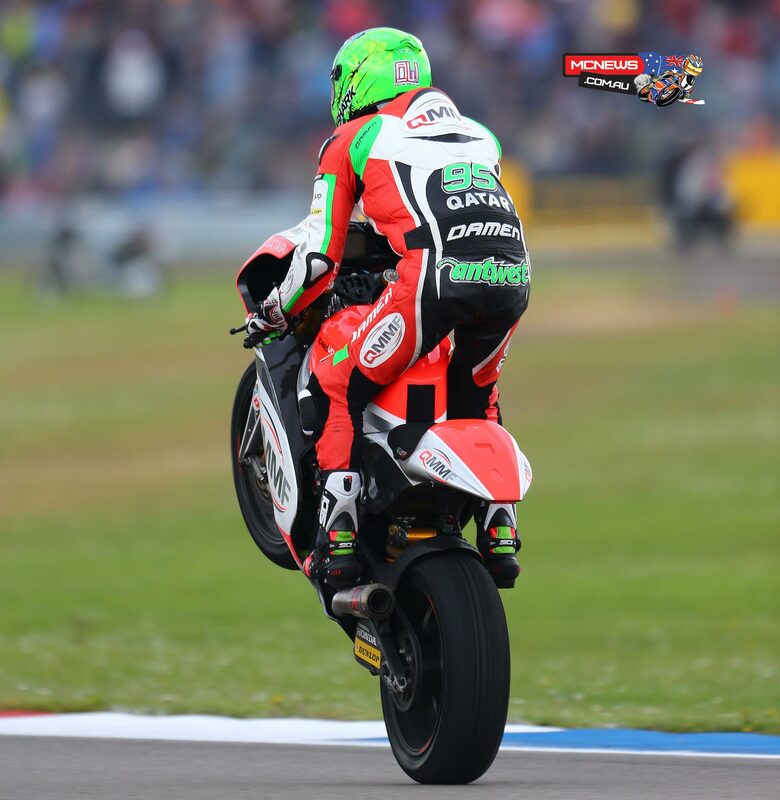 Johann Zarco (AirAsia Caterham Moto Racing), Alex De Angelis (Tasca Racing Moto2), Thomas Luthi (Interwetten Paddock Moto2) and Julian Simon (Italtrans Racing Team) all used their considerable experience to finish in fourth to seventh places restively. 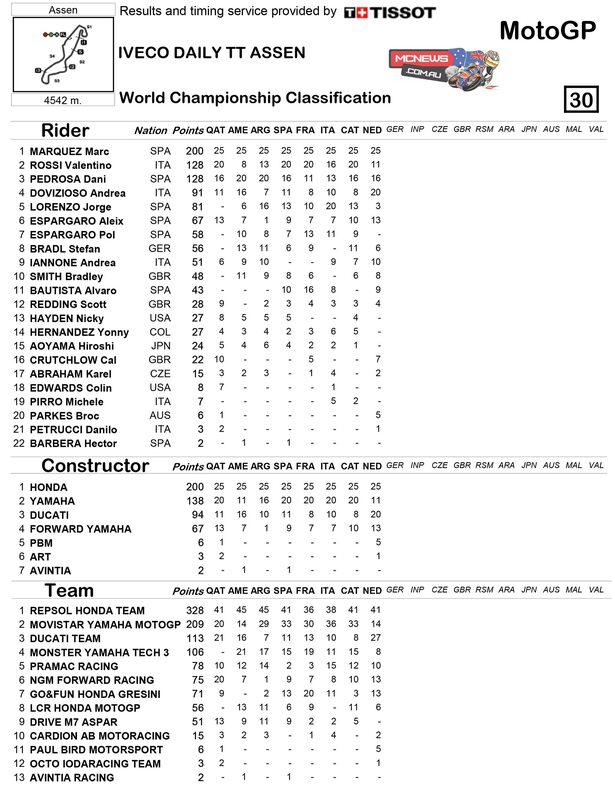 Behind Rabat, Lorenzo Baldassarri (Gresini Moto2) and Hafizh Syahrin (Petronas Raceline Malaysia) completed the top ten. 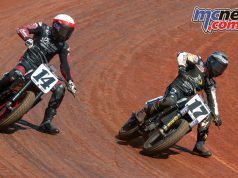 Simone Corsi (NGM Forward Racing) finished unlucky 13th after crashing out of the race lead at the midway stage, whilst Luis Salom (Pons HP 40) was 15th having crashed from third place in the final stages. Sam Lowes (Speed Up) had led the race at the start having taken the holseshot, but crashed twice after trying to stay with Corsi at the front. 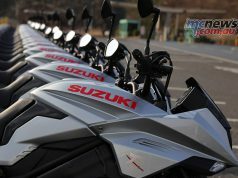 Several riders crashed and rejoined on a wet track which saw dry lines forming despite further rain during the course of the 24 lap, 109 km battle. Some took gambles on slick tyres which did not pay off whilst Dominique Aegerter (Technomag carXpert) went for a front wet, rear slick combination which only produced a 21st place result. 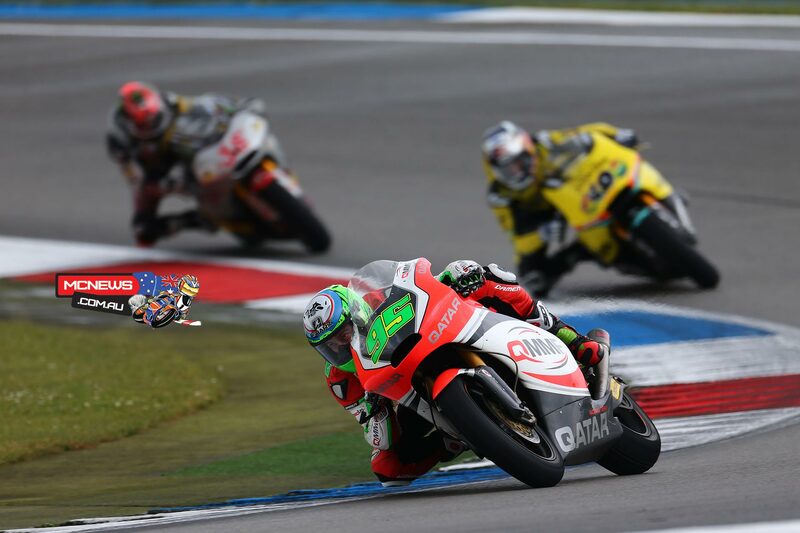 Azlan Shah (IDEMITSU Honda Team Asia), Axel Pons (AGR Team) and Sandro Cortese (Dynavolt Intact GP) all crashed out whilst Randy Krummenacher (IodaRacing Project) retired having previously crashed. 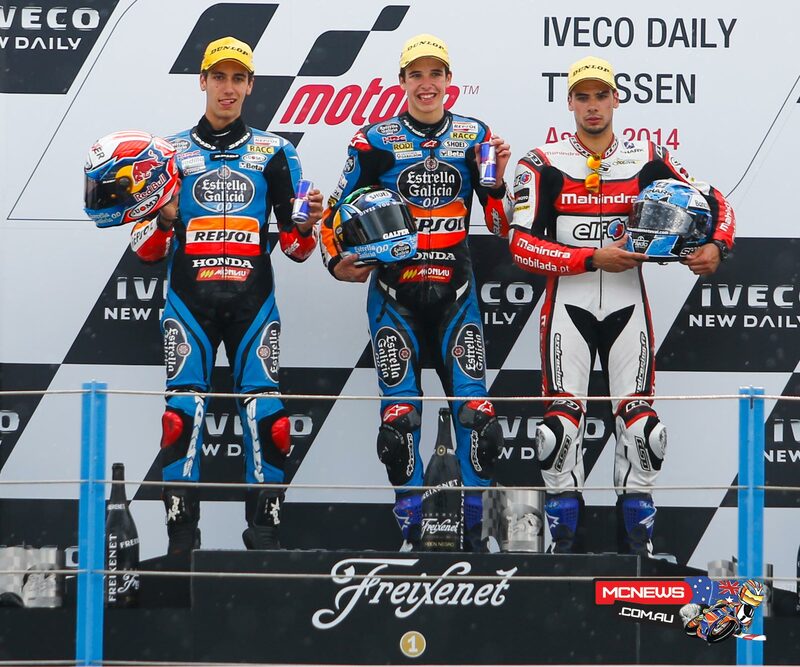 Alex Marquez (Estrella Galicia 0,0) took a second successive Moto3™ victory at Assen on Saturday, with Alex Rins and Miguel Oliveira joining him on the podium after crashes for championship frontrunners Jack Miller (Red Bull KTM Ajo) and Romano Fenati (SKY Racing Team VR46). 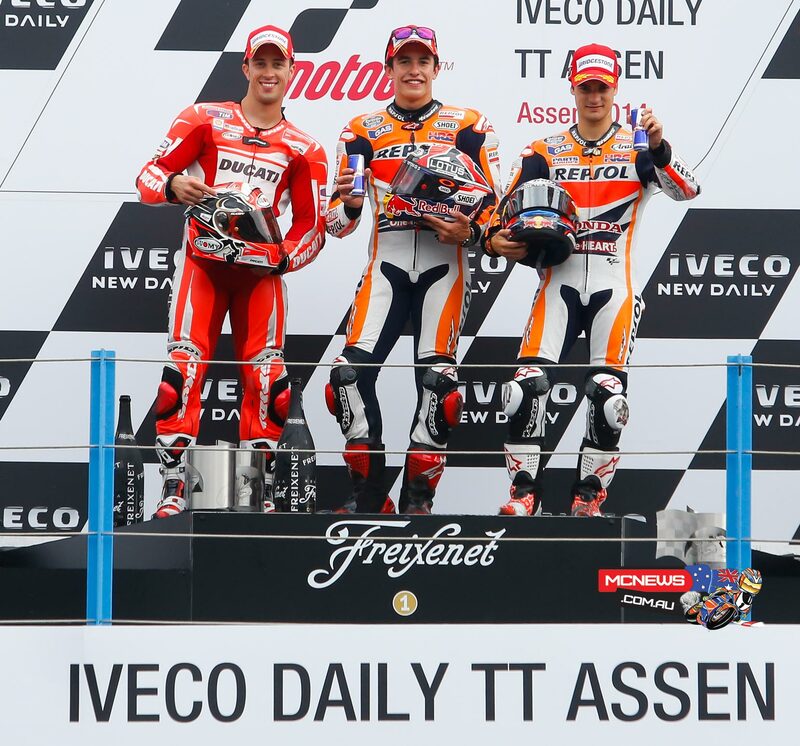 Marquez built on his Barcelona win with another dominant performance to take victory by three seconds, leading for the majority of the race from second on the grid. His teammate Rins briefly challenged him for the lead but the younger Marquez brother eventually had too much for his compatriot over the course of the 22 laps. 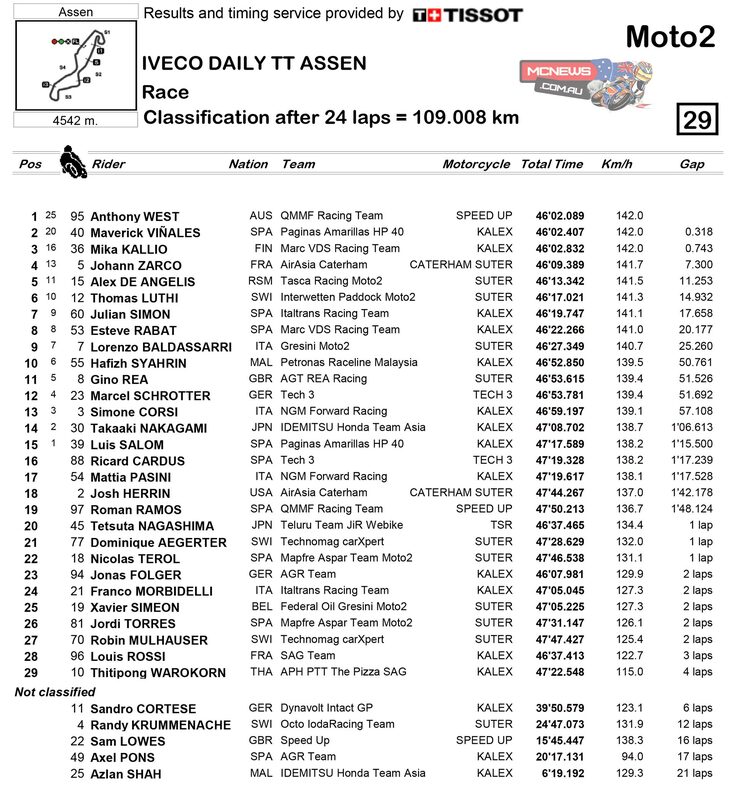 Rins overtook Oliveira for second in the final stages, whilst 12 seconds further back Alexis Masbou (Ongetta-Rivacold) won a tremendous battle for fourth between a group of seven riders. 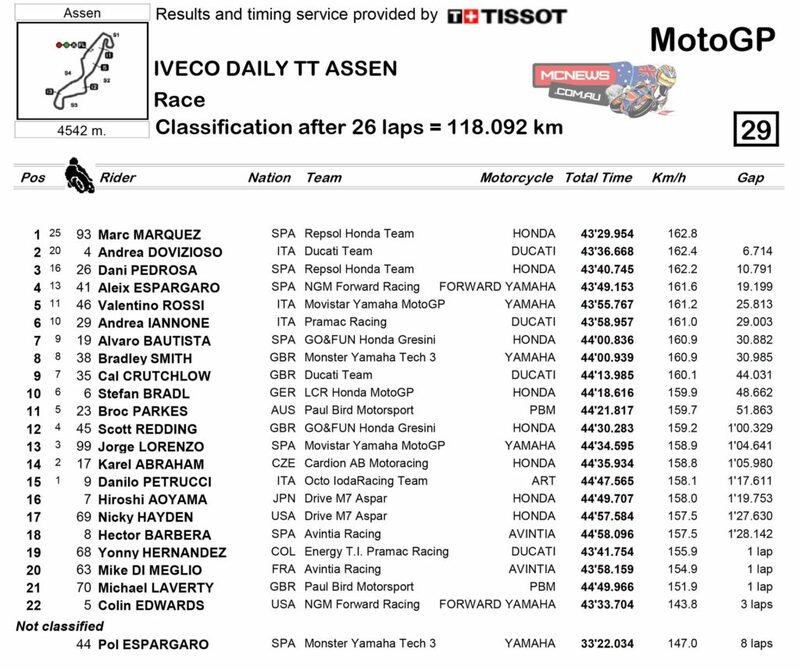 Those battling for fourth with Masbou were Niccolo Antonelli (Junior Team GO&FUN), Efren Vazquez (SAXOPRINT RTG), Isaac Viñales (Calvo Team), Danny Kent (Red Bull Husqvarna Ajo), Brad Binder (Ambrogio Racing) and John McPhee (SAXOPRINT RTG) – who completed the top ten. Miller crashed in the early stages whilst Fenati battled to 18th after coming back from an early mistake and then crashing to drop back again. 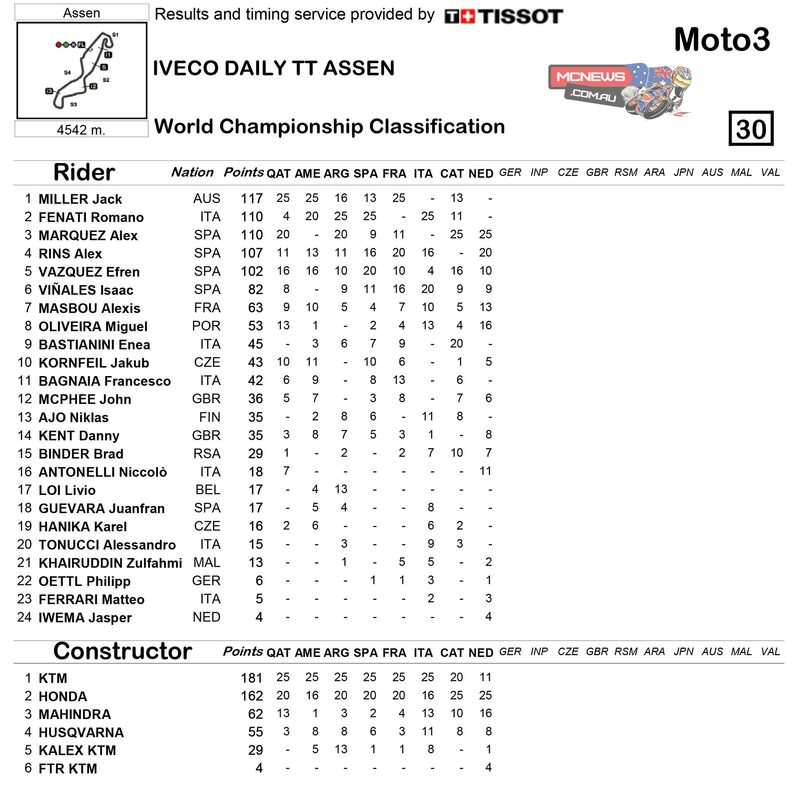 Neither of the championship front runners were hurt and they remain first and second in the standings with Miller still seven points in front, though Marquez has now pulled level second with Fenati, whilst Rins sits fourth – three points adrift of his teammate. Enea Bastianini (Junior Team Go&FUN Moto3), Niklas Ajo (Avant Tecno Husqvarna Ajo) and Karel Hanika (Red Bull KTM Ajo) all crashed out without major consequence, though Ajo was taken to the medical centre for checks on an ankle knock. A nasty collision between Luca Grünwald (Kiefer Racing), Juanfran Guevara (Mapfre Aspar Team Moto3) and Alessandro Tonucci (CIP) at the chicane on the final lap saw them all crash out, but fortunately all three were uninjured.